We removed all but about 1/4 inch of fat behind the skin, and cut the skin into roughly six inch squares or slightly bigger. The fat was reserved and I made something else with that (more in another post). Next we secured the pieces of pig skin to a cookie rack with a needle and twine (not an easy process by any measure), and actually resorted to a sharp nail to puncture the skin before tying it securing to the rack which was then placed in a cooke pan and placed in a pre-heated 325F oven. We slow-rendered the fat and it dripped to the pan below, this took some 90-100 minutes, then the heat was turned up to 375F and the two pieces of pig skin were browned a bit more. The result is pictured above. They LOOKED brilliant. Though they did remind me a bit too much of this little cufflink box I purchased many years ago made of pigskin/leather… the color was a dead ringer. :) I didn’t season this first “control” batch and just wanted to see how it would turn out. It was flat, it was crisp and it looked pretty darned good. But it was also nearly tasteless (no salt, pepper, sugar or spice), and after a few minutes, wickedly hard. Let’s just say if you had false teeth this would be a challenge to eat. For another batched of skin, I laid another pan ON TOP of the skin, then weighed it down with some cast iron equipment to FLATTEN the skin, without sewing it to the rack. After some 40-50 minutes of cooking in the open, I removed the weights on top and brushed the “flattened skin” with a mixture of soy, brown sugar, star anise, peppercorns, etc. on both sides and put them back into the oven to brown. I was trying to ensure I had a crisp base, and a flavorful sheen/finish. We continued the experiments on another day. This time first boiling the skin for 30 minutes in water flavored with star anise, salt, pepper, etc. then cooling and drying the skin and refrigerating it overnight. I figured I would try the crispy pata approach of sorts. Then I brushed the chilled pieces of skin with marinade and stuck it into a hot oven and proceeded to set off the smoke/fire alarms in a bit way. The result, above, looks burned but it wasn’t as crisp as I would have wanted. The marinade burned, but the skin wasn’t finished releasing its moisture yet. will there be a future zubuchon cracklings in the market. hope it will be distributed here in the states so i can savor it. the other day and up til now been munching on pork cracklings from mexico but not the same as those in cebu- love it. i forgot the name. i used to buy it at the back of the hospital where i had my internship. think its near cebu doctors.- like a stall of purveyors. I think the skin needs to be dried a few more days to remove most of the moisture for it to puff up nicely.A little more patience MM! 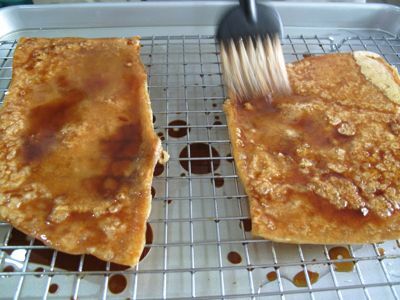 :) I think I will remove the soy sauce as it produces sugar resulting in the the burnt areas.I will just stick to plain salt and pepper and a few herbs and spices.Double frying may also help.I really appreciate it when you do these experiments!……very scientific! Noticed that pics are included in the feed. thanks! You can use the furniture needle w/c can be bought in any local hardware store. Around 4-5 inches, has a bigger hole(not sure what its called) and also a bit wicked looking. Oh MM you are so funny…with Sister coming home and cooking childhood memories of your mom’s cooking…it was pretty obvious you have already lost the bet. Well, don’t worry, I didn’t make it too. Not a pound to my name. 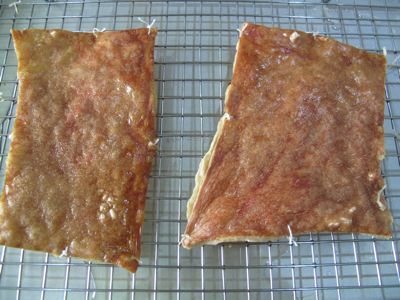 Anyway, pork cracklings…my mom used to do them too. She would actually boil them with salt and keep them in the pan until it turns into oil. (She would also do this on chicken skins.) We did this for the pork bellies that was cooked in turbo broilers, boil them and then put some salt on it again and then freeze them. … the skin would turn out crunchy. Maybe you can try that. Whooooooooa!!!!! Is this a Zubu-charon prototype? It would be great to have chicharon full of flavor and not laden with MSG!!!! 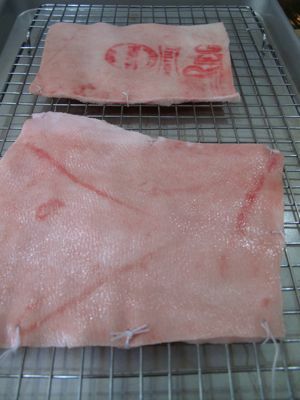 Hi MM, try Fergus Henderson Nose to tail pig skin recipe. It works for me !!! Keep on experimenting. :) Looking forward to it. I remember dad would make crackling at home but I didn’t pay attention how he was doing it. Right now, how I wish I paid attention on what he was doing in the kitchen before. Yum! I really enjoy reading your blog. When I cook roast pork with crackling, I pat the skin dry, score it and rub lots of sea salt onto it. But I still will have home-made chicharon anytime! 1. Rinse and dry your piece of skin. Using a non-reactive pan, spread a thin layer of salt on the bottom. Place the skin on top, and fold accordian-style if needed, so that all of the skin will fit in the pan. 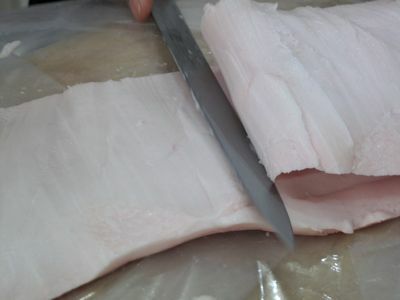 Each time you fold the skin over, sprinkle another thin layer of salt in between so that the entire surface area will be touching salt by the time you’re finished. Cover tightly with plastic wrap, and let sit in the refrigerator for 5 to 6 days. 2. After the salting period, soak the skin in a large bowl of cold water for at least 6 hours to one day in a refrigerator replacing the water once. 3. Preheat the oven to 300Â°F. Place the skin into a cast iron skillet or heavy pot. Cover the skin with the rendered fat. 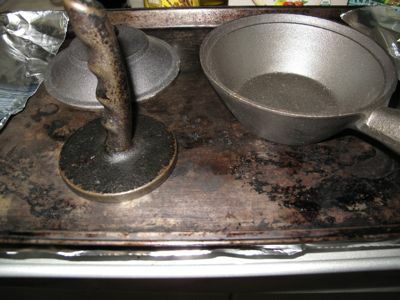 If you’re using a skillet or pan without a lid, cover the top with a sheet of foil. Place the covered vessel into the oven and cook for two hours, until the skin is very soft and shrunken. Be sure that the skin is gently simmering rather than deep-frying in the fat. If needed, turn the oven down to 250Â°F. 4. 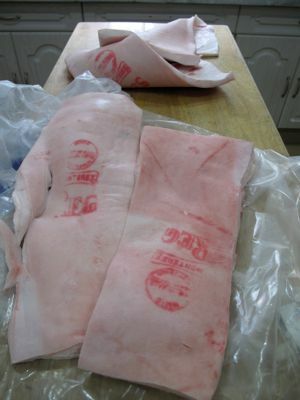 Kept in the refrigerator, the skin can be stored in the fat indefinitely. When you are ready to eat the skin, place the skin on a pan and crisp it in a 350Â°F oven for a few minutes, until the skin is puffed and golden brown. Cut into pieces and serve. Suggestion: Boiling to soften it (adding spices to the boiling mix) then drying it perhaps by storing it in the refrigerator overnight would make it easier to bake/fry to crispy texture. 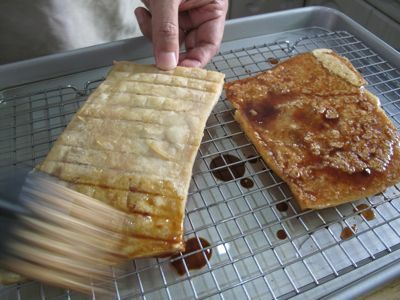 I would avoid the use of toyo or sugar as it would caramelize before the skin was done. Perhaps the use of younger piglet skin may not require boiling. Spread a layer of sea salt on a plastic tray, or anything that wonâ€™t react with the salt. Lay the skin on top & sprinkle liberally with sea salt. Leave in the fridge for 5 days. When its time is up, remove the skin from the fridge & soak overnight in cold water. Thoroughly dry with a clean tea towel & lay it on an oven tray. Cover with duck fat, then cover the tray with foil. Cook in a medium oven for 2Â½ hrs. As with all things cooking, keep an eye on it. Take it out of the oven & allow to cool, smearing it with the solidifying duck fat. At this point you can keep it in the fridge until your next drinks party, or a frail moment when you are in need of such nourishment. When such a moment arrives, place a rack on an oven tray, then lay your skin on top. Again put into a medium oven, in which it should slightly puff up into a sheet of golden, crispy joy (be careful not to brown it, as this is bitter & sad). Now remove from the oven & allow to cool. Place the crispy skin on a board & chop it with a heavy knife. It should break up into pieces. Serve. A word of warning, though: with fragile dental arrangements, eat with caution. MM…google ….justcookit.blogspot…I think that is what you are looking for! I have to forego trying his method or hubby will really never talk to me! 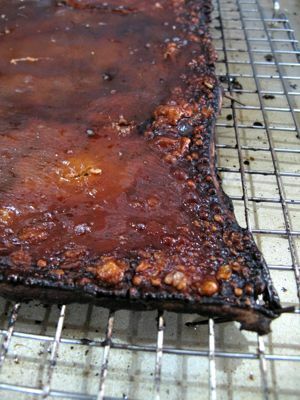 Crispy pork skin? MM or all you pork epidermis lovers, try this…sounds/looks ( pics included) simpler than the other methods. You can tweak/remove seasonings to your taste but you get the basic idea. how about using a turbo broiler? i remember how my mom used to “turbo” her lechon kawali. the skin was to die for! yum! the easiest way to do it. nuts for me to take back to california. thanks, mm…..
hi MM, those cracklings make me want to munch on those veggie cracklings. I have a suggestion: how about stitching the skin in a wire rack contraption that can be placed in a rotisserie – like the lechon. basting it once in a while with salted water to give its flavor and have a lechon looking crisp skin. what do you think? You’re trying to deconstruct Lechon Macau (Siu Youk?) aren’t you? 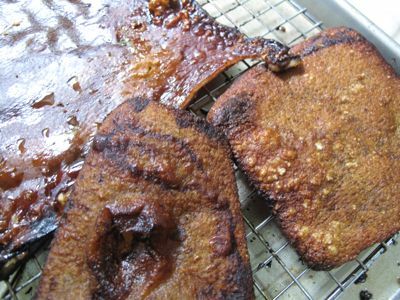 I’ve done several experiment with pig skin, but all have ended in failure. Steamed it, dried it, punctured it, used vinegar and lye water, baked, poured hot oil, etc. Extremely frustrating endeavor trying to work with pig skin trying to come close to the texture and flavor of lechon macau. I’m sure there’s a way to do it right, just haven’t found it. Maybe Jun B’s method will work. forget about Sports Illustrated, MM. you belong to Cook’s Illustrated! go,go, go! YouÂ´ve already invented the wheel with your Zubuchon. Is there any reward that we do not know of in reinventing it? Thanks for the link Ms. Connnie C! That Lechon Kawali looks goooooood to me. When hubby is away, I will make it!….not for me, of course, but for the kapitbahays! hmmm..can i be your kapitbahay, bettyq? That looks great! My husband would love it if I made that but I don’t know if I’m brave enough. I saw in one factory how they do it. a huge pot full of pork skins was slow cooked for 8 hours. Once cooked, they springle salt and pepper. Tasty and crispy. I make some kind of crackling out of the fatty pieces of my adobo. Adobo is never great when cooked without fat, but I mostly use it for flavoring since the sticky sauce is wicked enough over hot, steamed rice. Rather than discard the skin and fat however, I trim as much fat as I can, salt the pieces lightly, then let them dry in the ref for days. When I want some some crispy stuff, I fry some of the pieces over low-medium heat until they’re half done, let them sit to air dry for a while, then refry them briefly in a new batch of oil over high heat. As you can imagine, I don’t cook adobo often because eating it by itself makes me sin by consuming more than necessary, and eating the chicharong adobo skin makes me sin anew especially when there’s really good vinegar around. I call my adobo “adobong makasalanan”. If you’re really wicked, or have a death wish, you could make adobo out of chicken skin and use that for crackling. You know what might work if you want to secure pigskin to that cookie rack? If you get your hands on sutures, you can use the curved cutting needle to easily pierce the skin and thread to the tines of the rack. But then again, not sure if the suture itself will hold up to intense heat as they are made of nylon. There is a lesser known Filipino dish called lechon kawali, (which I think is an Ilonggo Dish),which literally mean lechon in a pan. 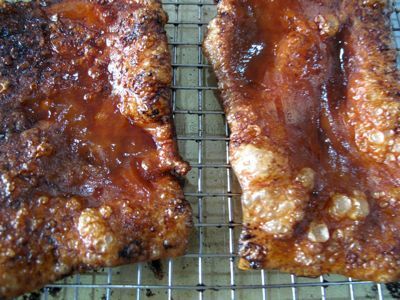 It would require a thick slice of pork with a deal of fat in it, a slice thicker than liempo. Then its just placed on pan with a very low heat, It usualy takes about 3 hours to cook. the goal is to deep fry it in its own fat very slowly. Finally, to make it crispier, while cooking, take it out of the pan, then dunk it it ice cold water for a few second, then deep fry it again.. you can do this several times. Slice it into bite size pieces to serve. for the dip, I’d recommend using native coconut wine vinegar or the pinakurat (from iligan city) which is stronger. Don’t Forget!!! Second Ornament Pick-Up Date Tuesday, 9 December 2008!! !